Spread over six acres of land, the resort is elegantly designed with Goan & Mediterranean touches. With 73 Bay View rooms offering stunning views of the Arabian sea, the remaining Garden View rooms give a delightful view of the lush green gardens. The peach colored hotel building is topped with brick red roof tiles & has been specially designed as an environment friendly resort. Take your pick from a variety of dining options from the multi-cuisine restaurant "Palmeira", specialty Chinese restaurant "Wan Hao" & the renowned seafood restaurant "Simply Fish". Rejuvenate at the Spa and Fitness which offers Ayurvedic massages, yoga & other holistic treatments. There is a full range of "Life Fitness" equipment, sauna and jacuzzi, squash and tennis courts & at the waters edge a freeform swimming pool with swim up bar. On the adjacent beach, diving activities, cruises and water sports can be arranged. 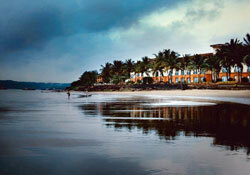 Goa Marriott Resort has three Restaurants, three Bars, a Pastry Shop and Delicatessen. Palmeira serves International cuisine and houses Goa's famous Jazz-Champagne Brunch. Wan Hao serves delectable Chinese dishes and authentic Schezuan menus. Simply Fish at the Waterfront serves Seafood. The Cake Shop & Delicatessen is famous for it's snack time savories and scrumptious Pastries. Goa , the beach city of India is one of the most beautiful tourists spots in the world. The beaches in Goa are acclaimed in all over the world for tis color and variety.